Located close to Llandovery in Carmarthenshire, known as ‘the Garden of Wales’, on the western edge of the Brecon Beacons National Park, an area of special landscape, wildlife and cultural heritage, and recently designated an International Dark Sky Reserve (the first in Wales and fifth internationally), and Fforest Fawr Geopark, the area designated in 2005 by UNESCO because of its outstanding geological heritage. There’s beautiful countryside where visitors can enjoy walking, bird-watching, cycling, mountain-biking, and other outdoor pursuits, or alternatively visiting local castles, gardens, woodlands, nature reserves, houses and sites of historic interest. Ideal for families, couples or groups of friends who would like to explore this special part of Wales or just to relax in peace and comfort. The Lodge is a detached house, not overlooked, with garden and views, sleeping up to eight people. 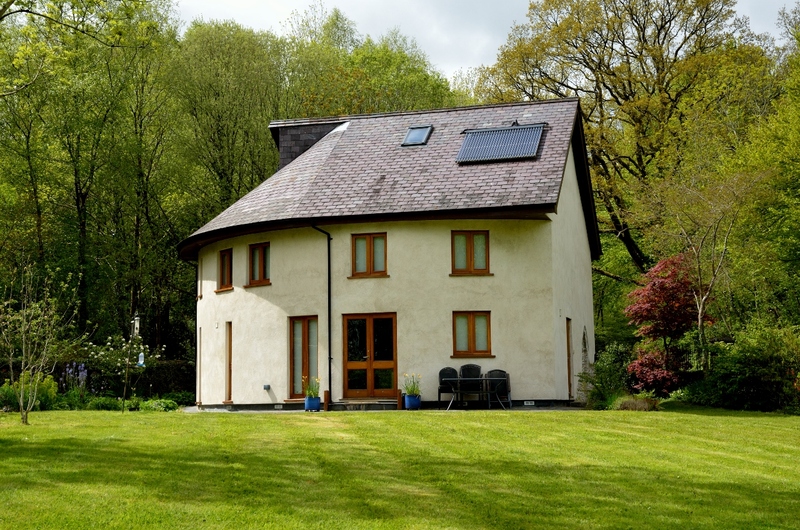 Solar hot water roof panels and ground source heat pumps provide the majority of the hot water and underfloor heating throughout the property. With sheep’s wool insulation, it’s warm and cosy. To see our Sustainability Policy, click on ‘green’. Find us also on the following websites: Greentraveller, Holiday Lettings/Trip Advisor, Owners Direct holiday accommodation, West Wales Holiday Cottages, Best of Wales (where we are listed as ‘Hafan Myrddin’), Brecon Beacons Holiday Cottages (where we are listed as ‘Llys Lodge’), Wales cottages, Quality Cottages (where we are listed as Towy Cottage), Elite Cottages, One Off Places and more. Contact us direct for the best price. Please also see our TripAdvisor reviews: Henllys Lodge and 5 star family rural retreat.